The relocation of the existing Library to a new building and integration of a dedicated Learning Center housed in the existing building across the main street forced the Mesquite Public Library team to connect user experience across two different structures yet within related services. Early community workshops indicated that the library would need to span generations, cultures, and learning levels and there was overwhelming enthusiasm to connect with local community through programming and unique service offerings. In the site diagram (circle #1) above, you can see how the Library and Learning Center face each other across the main street. Connecting the two experiences would be a challenge, at best. The entry concept focused on creating a swath of the same floor material (shown in a turquoise hue for identification) upon approach to each of the welcome desks. Once inside each location, this entry flooring would terminate at the HERO’S WALL. The fuschia bar in both plans indicates this wall and you can see the diagrammatic connection, or axis, between the two buildings with the dark teal dashed arrow. The HERO’S WALL is made up of colorful and mirrored wood blocks with varying face angles stacked within the wall frame. The many colors in the wall represent the complex emotions we encounter as we move through our own personal challenges. They strategically form a mountain summit motif, indicating that along the way to success there will be struggles and wins - yet, they are all worth it towards the goal at hand. The blocks themselves, with their close proximity and reliance on each other for structure, represent the support we receive from and give to our community. Lastly, the mirrors that are scattered throughout the wall remind the community that their self-discovery is the strength that helps them continue on their own journey. Once you have entered the main Library, the interior reveals itself as a play-inducing, tech-spirited environment that encourages patrons to interact with each other, explore, and grow. There is a front lounge “clubhouse” for hosting private events and/or for quiet, focused study. A teen center is tucked in the far corner, providing space that is indicative of a “hang out” environment while still connecting to the computer banks for homework and study. 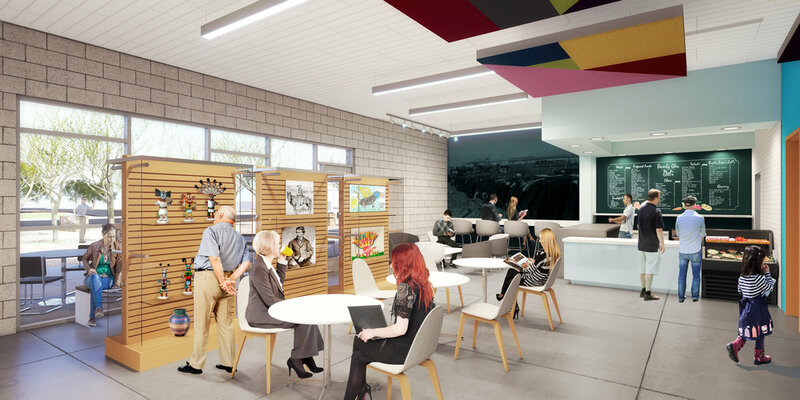 With a full wall of windows on the entry side of the building, one can see the rotating art gallery and cafe, connecting back to the robust local artist community and creating a unique, in-library vibe for a quick blast of cultural inspiration, a casual business meeting, or catch-up with a friend. A wall of windows flanks the rear of the building building as well, adjacent to the children’s area with a dedicated spot for story time, computer stations, and general bench-play merriment and exploration.